Whether you have used the first version of the Tugboat RDA or not, I can promise you that you will love the added features on the second version. Again, if you are one who appreciates this atomizer you will be happier to know that the second version is based on the manufacturer's desire to construct a product that will improve your flavor. I decided to do a Tugboat RDA V2 review to get a close look at what this atomizer can offer. I always like to look at products manufacturer in the USA. Call me biased but I certainly think that the standard of manufacturing in America is quite high. I love the peace of mind which come with knowing the working conditions of workers who have something to do with products I buy. The Flawless Vape Shop is becoming the synonym for great products when it comes to the Vaping industry. I know many people always ask why a product would get a 4.5 out of 5 instead of just a straight 5. Well, this means that I am happy with the product but I still appreciate the fact that it has its flaws. The one thing that makes me weary of giving a full 5, in this Tugboat atomizer review, is that I think this atomizer is a little too expensive. Otherwise, I really think that it is a great product when you look at the features I will deal with shortly. 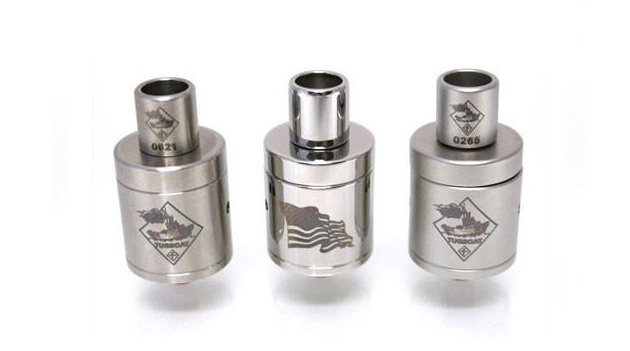 Any Tugboat V2 atomizer review that does not look at both the pros and cons of the product, is not a balanced one. This is the reason why I have decided to include this section in my review. Improved Airflow. One of the improvements you will notice in the new Tugboat V2 is better airflow. This is one of the reasons that make this product one of the best in its class. The 3 Post Design. The three post design ensures that this atomizer is able to accept both the single and dual coil structures. The drip well is also quite large in case you have plans to over drip. Adjustable Airflow Control. I also like the adjustable airflow feature that is equipped with large holes. Unattractive Logos. Someone seems to be selling the ludicrous logos that are all over this atomizer such as the American flag as if they were something good. I really didn’t like them. It not as if the atomizer belongs to the government of America or something like that. See what I mean on the image here. Expensive. I am always the first one to tell you that you pay for what you get. However, I still think that this atomizer is quite expensive. If I was looking at the product on its own without having to consider the price, I wouldn’t have a problem. Then, I guess this means that I accept that it is a good product. I certainly think that Flawless Vapor should be proud of themselves. They have manufactured a great solid product that has a number of improved features. These include improved flavor and performance. You will like the deep juice well. Some of the features I considered when doing this review include the following. At this point of my review, I will make it my duty to advance some advice. Exercise extreme care with this product. This is especially the case for those who do not have enough experience in the use of such products. It is a product manufactured for those who can access multimeter, and have a good knowledge of such electronic devices. I found this video on YouTube and am sure it can give you some basic knowledge about atomizers. May I safely conclude this Tugboat RDA review by saying that this is a product I will recommend. While it may come across as being expensive for others I certainly believe that you pay for what you get. I think the improvements that have been incorporated into the second version which include the double air holes and a big drip well make this one of the leading products in its class.